As you might be able to tell by now, the Spanish sure do love their lottery games. In addition to the multitude of games on offer, the el Nino New Year’s Raffle is yet another opportunity for players the world over to stand a chance of winning fabulous jackpot prizes. The Sorteo Extraordinario de El Niño, or more commonly known as the Spanish Winter Lottery, forms part of the super raffles offered in the Loteria Nacional Extra series. The name itself, “El Niño”, literally means “the small one”. We feel this to be slightly deceptive, however, especially when one considers the immense prize fund that this raffle boasts. 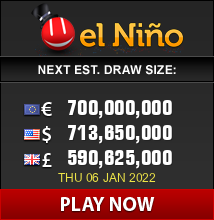 There is little doubt that the El Niño lottery has the ability to make its winner fabulously wealthy, with jackpot prizes in the hundreds of millions! The giant prize fund is not the only bait that lures in international lottery players, but also the fantastic odds of 1 in 3 and the fact that it’s possible to win up to eight times on a single ticket! This is thanks to the El Niño principle of sharing the maximum number of prizes between as many players as possible. This makes it one of the most generous (and successful) lotteries in operation today. The El Niño Lottery offers an identical gaming structure to the Summer El Gordo game. Players are encouraged to choose a number between 0 and 99,999 – thus, players have a total of 100,000 numbers to choose from. All 100,000 numbers are sold ten times across ten books (also known as “series”), with each series being divided into ten tickets, or “decimos”. To put it simply, each number can be played a total of 100 times. Players can purchase all the available tickets for one number, which would guarantee them the maximum prize in the event of that number being picked. Alternatively, they are able to select individual tickets for different numbers and thus receive 1/10th of the prize apportioned to the book if that number turns out to be the winning one. The El Niño draw takes place every year on the 6th of January, and the draws are always held in Madrid, Spain.